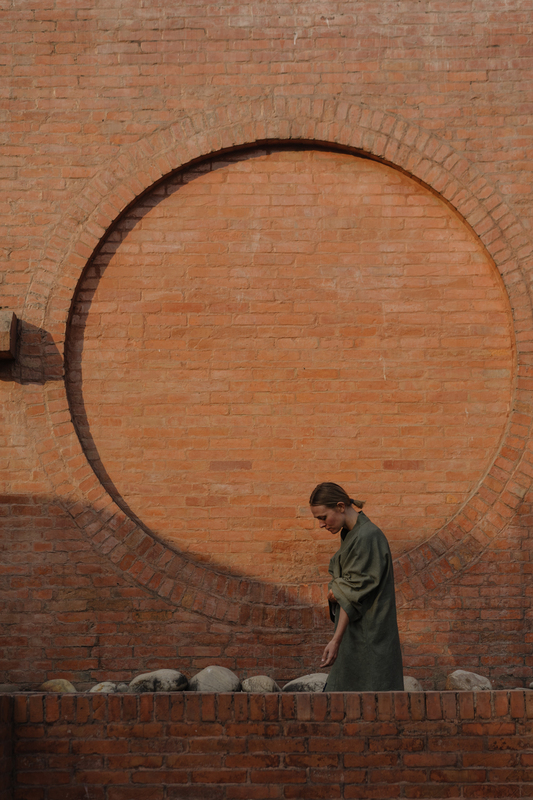 Consciously designed and made in Nepal and Bali. That soft touch that embraces you, that embrace with awareness, a piece one with nature and honoring the environment. We honor local craftsmanship and sustainability, therefore we plant dye our natural eco fabrics in Bali, Indonesia where exotic plants grow. 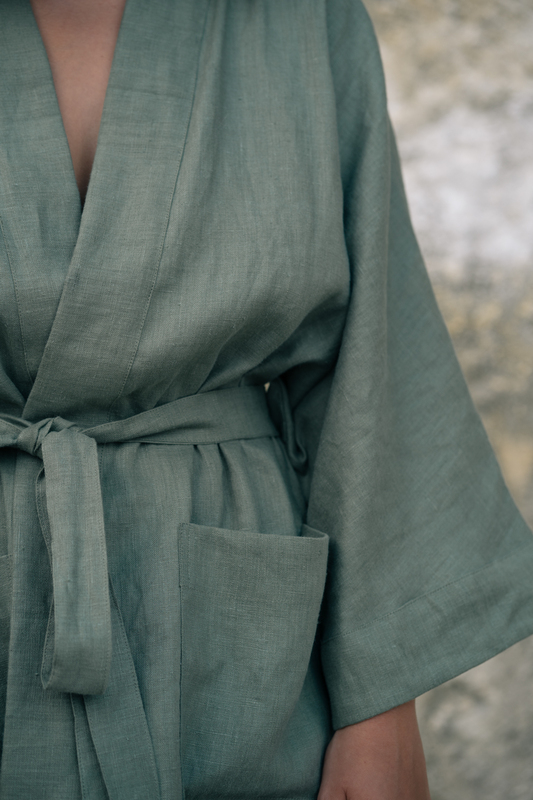 These organic heavy linen kimonos are meant to create a calm mind, the clean and pure design are timeless and can be worn various ways and occasions, from day till night it also can be worn in mornings honoring your body and mind with your self practice. A kimono is a traditional Japanese garment. ‘Ki’ means ‘to wear’ and ‘mono’ means ‘thing’ or ‘object’. The are often worn during important occasions as a formal clothing. Plant dye green: This kimono is plant dyed in a bath of Indigo and Indian almond leaves to create a soft green tone. Plant dye rust brown: This kimono is plant dyed in a bath of Sappan wood and Mahogany leafs to create this warm tone. We don’t want to produce more than needed. Therefore we accept only pre orders, this means you’ll have a product with more exclusivity personally created for you. It also means that you have to wait a bit longer than usually for your garment to arrive, around 3-4 weeks. Organic silk kimono inspired by the pureness of wearing something so soft light weighted, it allows the fabric to flow and drape with the wind. the clean and pure design are timeless and discrete the kimonos can be worn on various ways and occasions, from day till night. It can be worn as a dress with a belt or just simply let it drape over your shoulders. length: We have 2 lengths for this Kimono, the regular length of 90 cm and the115cm which can be versatile dressed up for evening occasions with for example a belt or over your dress. 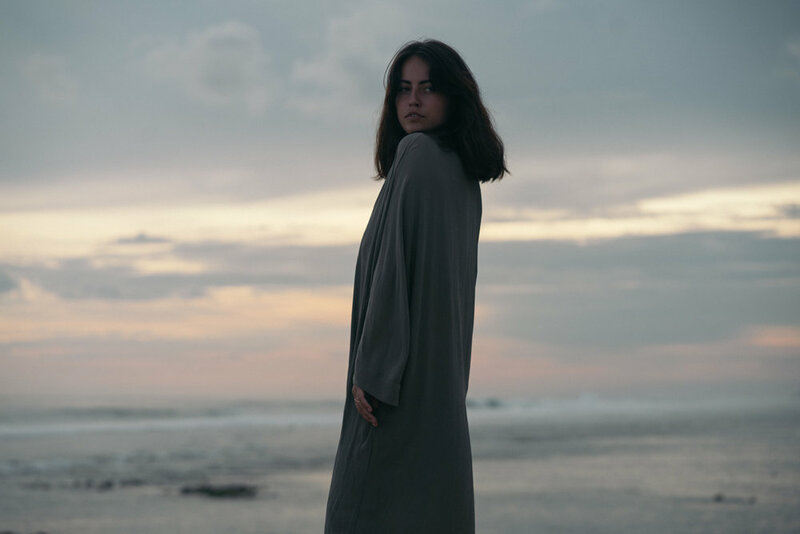 These organic heavy linen kimonos are meant to create a calm mind, the pure and comfortable design are timeless and can be worn various ways and occasions, from day till night. It can also be worn in mornings honoring your body and mind with your self practice. This kimono has oversized front pockets and a separate belt, so you can where with or without anytime you wish.